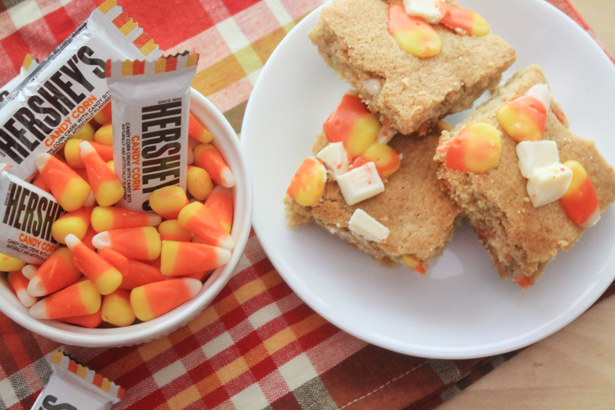 Candy Corn White Chocolate Blondies use Hershey’s seasonal treat to make them special. Every bite is something special. Oh, Target. Whenever any holiday approaches, from 4th of July to Thanksgiving, Target becomes a dangerous place for me to be. I just can’t resist the seasonal stuff. Be it in the dollar aisle or the seasonal section at the back of the store, I have no self control. This is why there are currently three seasonal kinds of Oreos in my cupboards right now (Caramel Apple, Pumpkin Spice, and Halloween, if you must know, nosy), a giant bag of candy corn, and the newest seasonal offering from Hershey; Candy Corn White Chocolate bars. I’ll admit, these sweet little treats, upon first inspection smell a little perfume-y. Maybe even waxy – though my husband would tell you all Hershey’s chocolate is waxy. But I just couldn’t resist white chocolate speckled with bright yellow and orange pieces and an undercurrent of sweet candy corn flavor… hint: it’s honey. But baked into a blondie? Whoa baby. Everything mellows out. The perfume goes away. You’re left with sweet, cocoa buttery chunks wafting through thick wedges of chewy blondies. Oh, and candy corn itself? Turns into molten pockets of caramel when baked in dough. Rev. E. Lation. 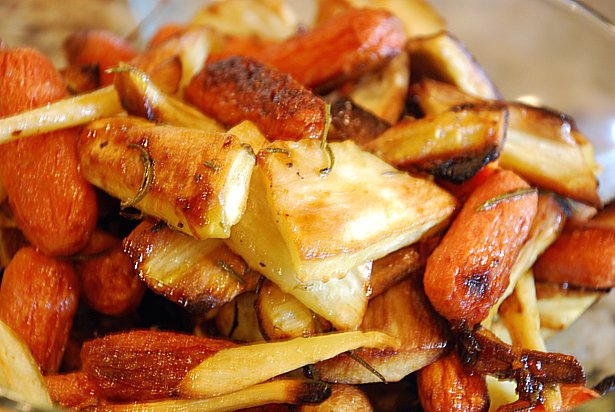 This is one of those recipes that, when made, did not go to work with The Brit. Instead, we nibbled on bars every chance we got, which is quite dangerous, because no two people should have access to an entire 9×13 tray of blondies for an unlimited amount of time. So I urge you, bake these immediately, but only in anticipation of an epic Halloween party or for sharing with lots of folks. They’re too good to keep around the house to yourself. Nobody needs a blondie hangover. Really. Are you a Target seasonal addict like I am? What’s your favorite Target-y thing to splurge on? Mine is clearly the holiday candy and cookies aisle. 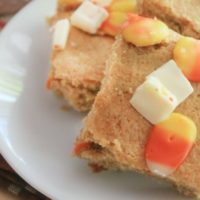 Candy Corn White Chocolate Blondies are the best way to celebrate Halloween! 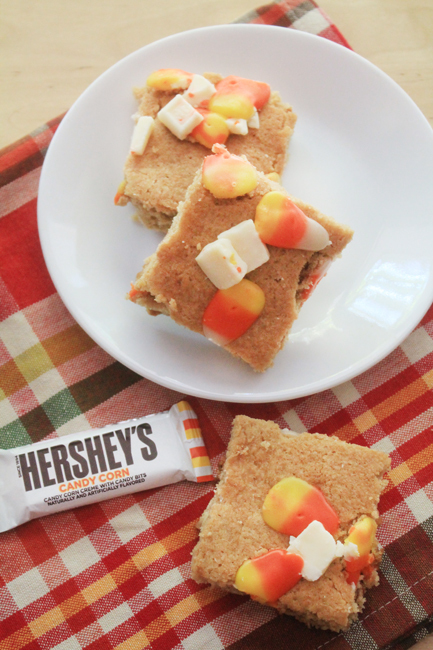 Sweet candy corn, plus Hershey's white chocolate candy corn bars make them absolutely irresistible! Melt butter in a large microwave-safe glass measuring cup, in 30 second increments, until butter is completely melted. Combine flour, baking powder and salt together in a small bowl. Use a whisk to combine and aerate the ingredients. In the bowl of a stand mixer, combine melted butter, brown sugar and granulated sugar together, mixing on medium speed until well combined and light and fluffy. Add eggs, one at a time, mixing until fully incorporated after each addition. Add vanilla extract and mix again. Scrape the sides of the bowl and mix one last time to make sure all ingredients are well combined. Remove bowl from stand mixer and add roughly chopped white chocolate candy corn pieces and candy corn. Mix through the batter by hand. Spray a 9?x13? baking pan or casserole dish with cooking spray. Spread batter into pan and press evenly with a spatula so that batter reaches into every corner and along the edges. Bake for 35 to 40 minutes, watching closely. 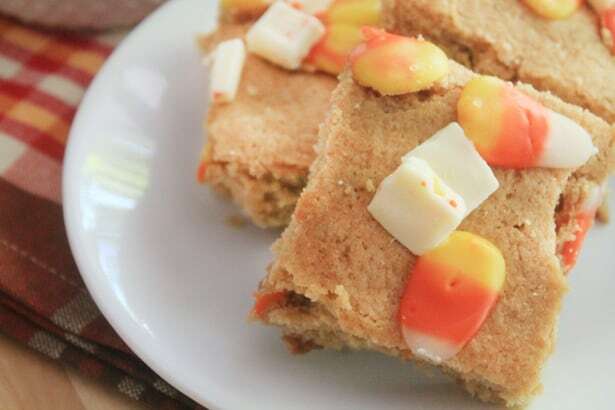 When blondies have reached mostly golden brown and have roughly 3 minutes left to bake, sprinkle the top of the blondies with more chopped white chocolate candy corn pieces and regular candy corn. Allow to bake for only 3 minutes more, as candy corn melts very very quickly and will turn into pools of molten sugar instead of decorative yellow-orange-white pieces. Allow to cool, then cut into bars and serve. Stores in an airtight container for up to 3 days. 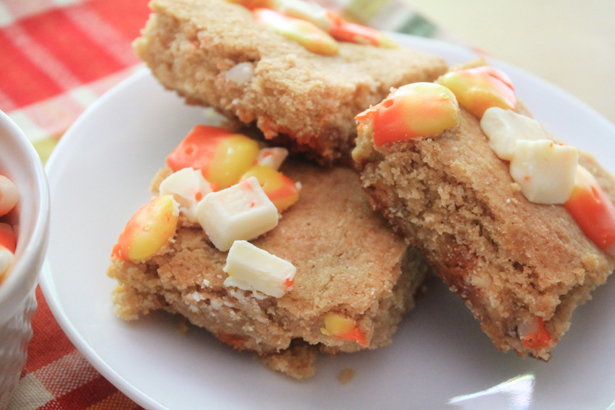 I do not see how many eggs I need to add to Candy corn white chocolate Blondies recipe. Could you reply how many egg? Thanks! Love these Amber. 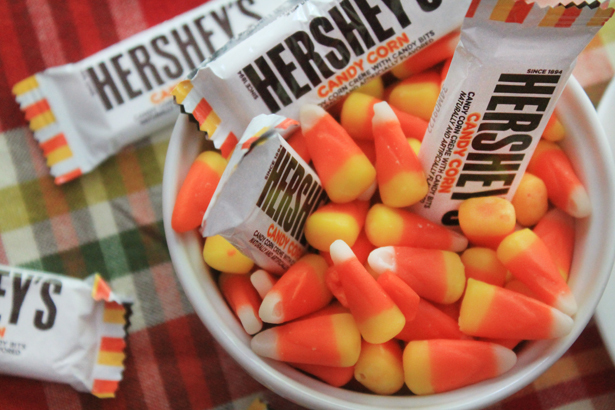 More recipes need candy corn year round. These are adorable — and YES, target gets me every single time too!! I bought a bag of those and ate them all. By myself. In one night. It was bad. I totally want to buy another bag to make these though! Whoa, girl. That’s commitment! You’ve got to make these! I don’t often repeat baked goods, but these are getting repeated.